The destruction of bone and cartilage is characteristic of the progression of musculoskeletal diseases. The present review discusses the developments made with two different classes of drugs, the bisphosphonates and matrix metalloproteinase inhibitors. Bisphosphonates have proven to be an effective and safe treatment for the prevention of bone loss, especially in osteoporotic disease, and may have a role in the treatment of arthritic diseases. The development of matrix metalloproteinase inhibitors and their role as potential therapies are also discussed, especially in the light of the disappointing human trials data so far published. Structural damage to the joint is characteristic of both rheumatoid arthritis (RA) and osteoarthritis (OA). It is a predictor of long-term outcome and it contributes over time to functional decline, disability and major surgical procedures. Protecting bone and articular cartilage from damage consequently has major potential both therapeutically and economically. It has been estimated that approximately 25% of disability in RA can be explained by progressive joint damage after the first 5–10 years . If joint destruction can be prevented or significantly reduced then the long-term function of joints could be preserved, severe disability could be avoided and patients would benefit from a much improved quality of life. The breakdown of cartilage and bone in the arthritides leads to structural damage and prevents joints from functioning normally. The present review investigates agents that protect these tissues and therefore have the potential to prevent or retard joint damage. Cartilage contains different types of collagen; these rod-shaped molecules aggregate in a staggered array, forming crosslinked fibres that give connective tissues strength and rigidity . Trapped between the collagen fibres in cartilage are the proteoglycans , molecules that consist of three globular domains interspersed with heavily glycosylated and sulphated polypeptide. These form highly charged aggregates that attract water into the tissue, and therefore allow cartilage to resist compression. Cartilage contains only chondrocytes, which in normal adult cartilage maintain a steady state between matrix synthesis and degradation. In contrast to cartilage, bone contains multiple cell types. Type I collagen is laid down by osteoblasts and is then calcified. The resorption of bone requires the formation of osteoclasts, specialised cells that demineralise bone at low pH and then degrade collagen. The synthesis of matrix components during growth and development in both bone and cartilage exceeds the rate of degradation; a reduction in matrix synthesis and an increase in the rate of degradation occurs during matrix resorption. Extracellular matrix proteins are broken down by different proteolytic pathways. The four main classes of proteinases  are classified according to the chemical group that participates in the hydrolysis of peptide bonds. Cysteine and aspartate proteinases are predominantly active at acid pH and act intracellularly; the serine and metalloproteinases, active at neutral pH, act extracellularly. Some enzymes may not participate in the cleavage of matrix proteins, but do activate proenzymes that degrade the matrix. All classes of proteinase play a part in the turnover of bone and cartilage; one proteinase pathway may precede another, and different pathways predominate in various resorptive situations. The proteinases produced by chondrocytes play a major role in OA, while in a rheumatoid joint proteinases produced by chondrocytes, synovial cells and inflammatory cells all contribute to matrix loss. In RA, bone is also destroyed ; both the matrix metalloproteinases (MMPs) and cysteine proteinases are involved . When bone is normally resorbed, osteoblasts respond to agents such as parathyroid hormone, IL-1 and tumour necrosis factor alpha (TNFα) by increasing the secretion of MMPs that, once activated, remove the osteoid layer on the bone surface. Osteoclast precursors then adhere to the exposed bone surface and differentiate to form a low pH microenvironment beneath their lower surface that removes calcium. Lysosomal proteinases are then released to resorb the exposed matrix. Cathepsin B and cathepsin L cleave collagen type II, type IX and type XI, and destroy the crosslinked collagen matrix at low pH . Cathepsin K is also produced by osteoclasts and plays a key role in the degradation of bone collagen. It cleaves type I and type II collagen at the N-terminal end of the triple helix at pH values as high as pH6.5 , and expression of mRNA for cathepsin K is found at sites of bone resorption in the rheumatoid joint . When cathepsin K is deficient, bone resorption is impared. Cathepsin K is also produced by synovial fibroblasts and is thought to contribute to synovial initiated bone and cartilage destruction in the rheumatoid joint . Bisphosphonates were initially used either as corrosion inhibitors or as complexing agents in the textile, fertilizer or oil industries . It was shown in the 1960s that pyrophosphate (Fig. 1) inhibits calcification of tissues by binding to hydroxapatite but that orally administered pyrophosphates are hydrolysed in the gut. Bisphosphonates are resistant to hydrolysis and so could be administered orally . The first bisphosphonate used for human treatment was etidronate for myositis ossification . It was discovered that bisphosphonates inhibited osteoclastic-mediated bone resorption [14, 15], and this led to their use as bone protective agents. Structure of pyrophosphate and a generic bisphosphonate. 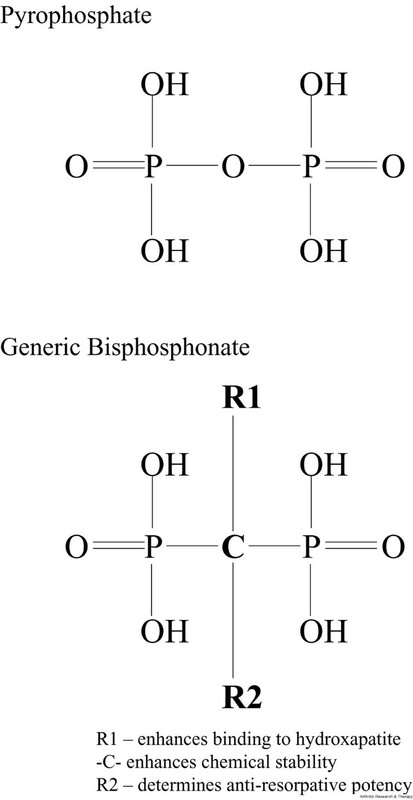 All bisphosphonates have the same generic structure (Fig. 1). The hydrolysable oxygen atom that separates the two phosphate groups in pyrophosphates is replaced with a more stable carbon atom. The P–C–P structure is responsible for giving bisphosphonates their high affinity for bone, which can further be enhanced by the substitution of a hydroxyl group for the R1 side chain . The R2 side chain is important for conferring the antiresorptive potency to the bisphosphonates. Extensive modifications of the R2 side chain showed that a basic primary nitrogen group attached to an alkyl chain, such as in pamidronate and alendronate (Fig. 2), produced more potent antiresorptive agents (10-fold to 1000-fold) than the earlier generation bisphosphonates, such as etidronate, with a single methyl group side chain. Structures of the R1 and R2 side chains (see Fig. 1) of bisphosphonates investigated in humans. The bisphosphonates are grouped according to their potency for inhibiting bone resorption in rats. When the nitrogen atom was combined as a tertiary amine in the R2 side chain, such as in ibandronate and olpadronate, the bisphosphonates were even more potent. However, the most potent bisphosphonates to date are those that contain the nitrogen within a cyclic structure, such as in risedronate and zoledronate. These cyclic nitrogen structures are up to 10,000-fold more active than etidronate. The structures of the side chains of the bisphosphonates used for human therapy are shown in Figure. 2 along with their relative potency at inhibiting bone resorption in rats as compared with etidronate . Bisphosphonates were initially thought to affect bone resorption by a physical process that directly inhibited the dissolution of mineralisation . However, the effective levels of some newer bisphosphonates to inhibit bone resorption were well below the levels needed to have a physical effect. Bisphosphonates predominantly affect bone resorption by altering the cellular metabolism, although their ability to bind to the calcified matrix is important to localise them to bone. Bisphosphonates target the osteoclast directly either by increasing apoptosis or by affecting metabolic activity . The circulating levels of bisphosphonates are extremely low as they are rapidly absorbed by bone, suggesting that circulating levels are not relevant to function. This is further supported by the fact that a single large dose of bisphosphonates can have a sustained effect on bone resorption . To avoid the potential gastrointestinal problems associated with the newer nitrogen-containing bisphosphonates, both risedronate and ibandronate are undergoing clinical trails to determine whether monthly injection is a suitable delivery method for these bisphosphonates . During bone resorption, the osteoclasts demineralise the extracellular matrix of the bone, and bisphosphonates are released from the bone surface and absorbed by osteoclasts [18, 19]. Cellular uptake of bisphosphonates leads to the loss of the ruffled border between the osteoclast and the bone surface [20, 21], to disruption of the cytoskeleton [19, 22] and to loss of function. Both alendronate and tildronate can inhibit several protein tyrosine phosphatases [23–25] and can also affect small GTPases such as Rho and Rac, explaining some of the cytoskeletal effects. Bisphosphonates also inhibit the osteoclast proton pumping H+ ATPase [26–28] and lysosomal enzymes, which contributes to the loss of function. Bisphosphonates can cause osteoclasts , macrophages [30, 31] and myeloma cell lines [32, 33] to undergo apoptosis. The induced osteoclast apoptosis may be caused by a general disruption that pushes the cells towards apoptosis, which may account in part for the inhibition of bone resorption. Bisphosphonates also inhibit osteoclast differentiation, the formation of osteoclast-like cells in culture  and the generation of mature osteoclasts in culture [35–37]; these effects will contribute to the prevention of bone resorption. The more potent nitrogen-containing bisphosphonates inhibit the farnesyl diphosphate synthase enzyme of the mevalonate pathway  that is responsible for producing cholesterol and isoprenoid lipids. 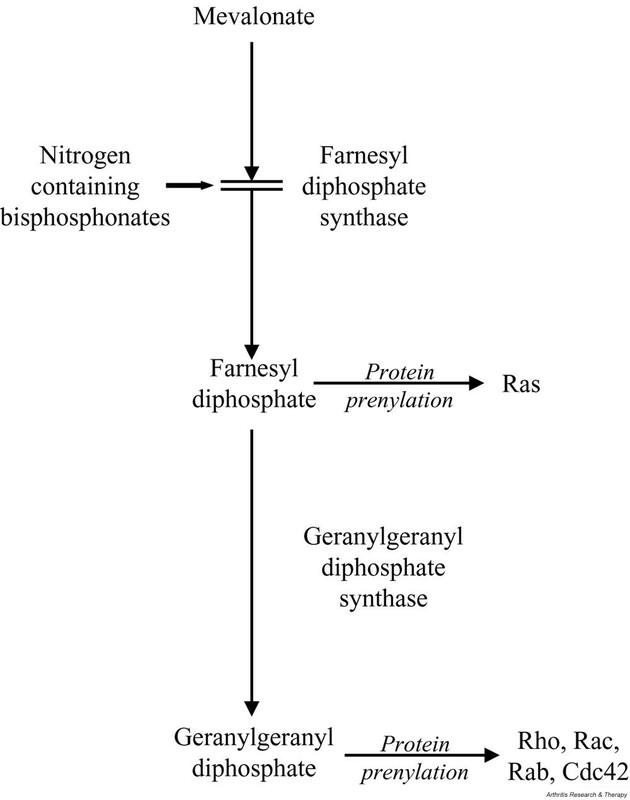 Two of the isoprenoid lipids, farnesyldiphosphate and geranyldiphosphate, are required for the normal prenylation of the small GTPases such as Ras, Rho and Rac; a process essential for the correct functioning of these enzymes  (see Fig. 3). These small GTPases control the osteoclast cell morphology, the cytoskeletal arrangement, membrane ruffling, the trafficking of vesicles and apoptosis [39–41]. It is believed that the more potent nitrogen-containing bisphosphonates inhibit osteoclast function by inhibiting these small GTPases. This effect on protein prenylation in osteoclasts has been demonstrated in vivo for aldronate . Schematic showing the mevalonate pathway. 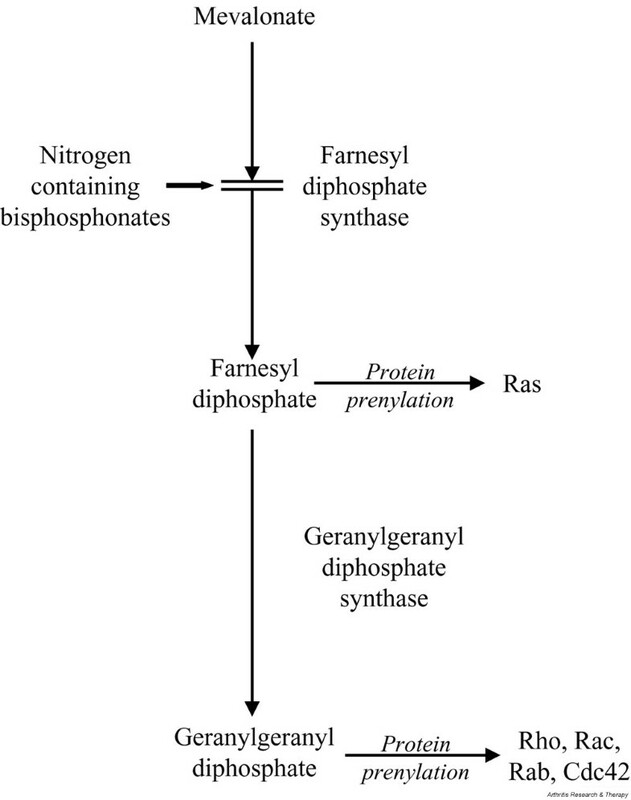 Nitrogen-containing bisphosphonates inhibit the farnesyl diphosphate synthase enzyme, which prevents the production of farnesyl diphosphate that is required for protein prenylation. Inhibition of protein prenylation leads to loss of association of GTP-binding proteins with the cell surface and to a breakdown in intracellular signalling. Bisphosphonates that have a structure similar to pyrophosphate (e.g. chlodronate and etidronate) become incorporated into nonhydrolysable analogues of ATP [43, 44], which accumulate within the osteoclast leading to impaired function. Chlodronate, etidronate and tiludronate can all be metabolised in mammalian cells [42, 45], via the cytoplasmic aminoacyl-tRNA enzymes. ATP analogues accumulate within the cytoplasm, where they interfere with numerous biological processes, eventually causing both osteoclast and macrophage apoptosis . This appears to have been confirmed when the nonhydrolysable ATP analogue metabolite of chlodronate produced identical effects to that seen for chlodronate alone [42, 46]. Encapsulated chlodronate works in an identical manner to cause apoptosis in macrophages in vivo by a buildup of nonhydrolysable ATP products in the cytoplasm . The more potent bisphosphonates that contain a nitrogen in the side chain are not metabolised in this way [15, 25, 46]. Bisphosphonates inhibit calcification by binding to the surface of solid calcium phosphate crystals and acting as crystal poisons affecting both crystal growth and dissolution . There is a positive correlation between the binding effects of the various bisphosphonates and their ability to inhibit crystallisation , further supporting a physical mechanism. Bisphosphonates are excellent inhibitors of bone resorption, with their potency varying according to the structure of the side chains. Treatment with bisphosphonates reduces the steady-state level of resorption dependent upon the administered dose [49, 50]. Many different osteoporosis models have been investigated [51–56]. Bisphosphonates are also effective in decreasing bone loss and increasing mineral density in postmenopausal osteoporosis [57–62] and corticosteroid-induced bone loss . Bisphosphonates improve the biomechanical properties of bone in both normal animals and models of osteoporosis [51, 64–67] and, along with hormone replacement therapy, calcium and vitamin D supplementation, have led to a significant improvement in the management of osteoporosis. It has also been demonstrated that, in humans, bisphosphonates inhibit tumour-induced bone resorption, correct hypercalcaemia, reduce pain, prevent the development of new osteolytic lesions, prevent fractures and, consequently, improve the quality of life for the patients [47, 68–72]. If bisphosphonates are encapsulated in a liposome, they are no longer sequestered by the skeleton; instead, they are taken up by active phagocytic cells such as macrophages . In animal models, encapsulated clodronate was found to reduce the numbers of macrophages and to reduce inflammation [74–76]. When a single intra-articular injection of encapsulated chlodronate was given to patients with RA, a depletion of synovial macrophages was observed and the treatment was well tolerated by the patients . Macrophage levels are predictive of radiological damage in rheumatoid arthritis [78, 79] so that the treatment of patients with encapsulated bisphosphonates could be effective. Certain bisphosphonates directly inhibit some MMPs (discussed later). In experimental animals, bisphosphonates prevent the calcification of soft tissue [80, 81] and are effective in preventing calcification of aortic valve implants . Human applications have been less successful [83, 84] as the effective dose required to inhibit calcification is enough to interfere with normal mineralisation. Bisphosphonates have been shown to be effective at reducing dental calculus [85, 86] when added to toothpaste. Many bisphosphonates have an adverse effect upon the gastrointestinal tract when taken orally, possibly because they impair cellular metabolism and increase the level of apoptosis. These side effects are intensified in bisphosphonates containing an amine group and include nausea, dyspepsia, vomiting, gastric pain and diarrhoea. The bisphosphonates pamidronate and alendronate, when given orally, can cause oesophagitis erosions and ulcerations [87–89]. Some of the nitrogen-containing bisphosphonates are potent inhibitors of squalene synthetase, one of the enzymes in the cholesterol biosynthesis pathway. A reduction in cholesterol levels after bisphosphonate treatment has been demonstrated in animals . Considerable progress has been made in the design of new and effective bisphosphonates. The original assumption that the mechanism of action of these compounds involved a strong physical interaction with the mineral phase only partially explains their action. It is now recognised that many of the effects result from interfering with essential cellular functions of osteoclasts. Some actions of the bisphosphonates can be separated, with different roles for the backbone and side chains of the molecule. In the future, it is probable that specific bisphosphonates will be produced that can target individual metabolic pathways within the cell to produce more bone-specific actions with less action on neighbouring cell types, reducing the occurrence of side effects. MMPs are a group of neutral proteinases that collectively degrade the extracellular matrix. They have a conserved domain structure and contain a zinc ion at the catalytic site. The activity of the MMPs is tightly regulated at three levels: transcriptionally, through transcription factors such as activator protein 1, NFκ B and mitogen-activating protein kinase pathways; by activation, MMPs are secreted as inactive zymogen and require the proteolytic cleavage of the prodomain for activation; and by inhibition, by the tissue inhibitors of metalloproteinases (TIMPs) that bind to activated MMPs. A variety of cytokines increase the production of MMPs, including IL-1, TNFα, IL-17 and oncostatin M, and these agents are found within inflamed joints. Some MMPs are activated intracellularly (membrane-type MMPs and MMP-11) by furin, a serine proteinase that recognises a unique motif in the prodomain [91, 92]. These enzymes are thought to initiate activation cascades, and membrane-type MMPs can activate other MMPs including MMP-13. MMP-3 and urokinase-type plasminogen activator can also initiate activation cascades, and both are present in the joint. Activation is an important control point determining whether matrix resorption occurs, but the level of active MMP must exceed those of the TIMPs. There are four TIMPs that are widely expressed through the body, with all cell types expressing at least one family member. TIMPs differ in their ability to inhibit all MMPs. For example, TIMP-1 cannot inhibit most of the membrane-type MMPs, and TIMP-4 inhibits MMP-1, MMP-2, MMP-3, MMP-7 and MMP-9. Tissue destruction thus only occurs when MMPs are upregulated, are activated and the level of active MMP exceeds local levels of TIMP (Fig. 4). Any of these three regulatory steps are potential targets for therapeutic intervention. Control steps for matrix degradation by matrix metalloproteinases (MMPs). Cells are initially stimulated by proinflammatory cytokines through cell surface receptors. These receptors then transfer the signal to the nucleus via a series of signal transduction pathways leading to mRNA upregulation. The MMP is synthesised and secreted in an inactive proform and requires activation by enzymic cleavage of the prodomain. Cells also produce natural inhibitors of MMPs, called tissue inhibitor of metalloproteinases (TIMPs), that inhibit the activated MMPs. Uncontrolled matrix degradation only occurs when the balance between the TIMP and the active MMP shifts in favour of degradation. MT, membrane type; TNFα, tumour necrosis factor alpha. A family of metalloproteinases closely related to the MMPs is also implicated in cartilage biology, particularly in the turnover of proteoglycan. The family of a disintegrin and metalloproteinase domain (ADAM) contains proteinases with diverse functions such as sperm–egg fusion and the release of cell surface proteins conferred by the addition of different protein domains . ADAM-17 is known for its ability to release TNFα from the cell surface . The disintegrin domain, which binds to integrins and prevents cellular interactions, is found with cysteine-rich, epidermal growth factor-like, transmembrane and cytoplasmic tail domains. The ADAM thrombospondin-like repeat (ADAMTS) family members are distinguished from the ADAMs in that they lack these latter three domains but have additional thrombospondin 1 domains at the C-terminus that mediate interactions with the extracellular matrix. ADAMTS-4 and ADAMTS-5 cleave proteoglycan , and ADAM-10, ADAM-12, ADAM-15 and ADAM-17 are also found in cartilage. Many members of the ADAMs family are inhibited by TIMP-3. MMPs are also involved with the removal of proteoglycan in the later stages of disease. The cartilage is slowly lost during the arthritic degeneration of a joint, leading to eventual joint failure. The loss of proteoglycan is a rapid but reversible phenomenon, while collagen release leads to the loss of the structural integrity of the collagen and to eventual joint failure. Fibrillar collagen is resistant to proteolytic degradation but at neutral pH is susceptible to degradation from the collagenases MMP-1, MMP-8 and MMP-13 that are all found within the joint. MMP-2 and MMP-14 can also cleave collagen. Some studies suggest that protecting aggrecan, which is often released prior to collagen, is the best therapeutic strategy for joint diseases . Such inhibitors would need to penetrate the highly charged cartilage matrix prior to proteoglycan release to be successful. The chondrocyte responds to external stimuli by rapidly releasing aggrecan, possibly as a protective mechanism for tissue integrity; proteoglycan is resynthesised once the insult is removed. Inhibition of this response may cause damage in the longer term. Alternatively, the protection of collagen means that the inhibitors would prevent damage before it becomes irreversible. The two main cell types within the joint, chondrocytes and synovial lining cells, can make all the known collagenases, and therefore identifying the major collagenase for a particular type of arthritis will be important when selecting a MMP inhibitor. However, the contribution of particular collagenases towards the destruction of arthritic joints remains to be clearly demonstrated. Both MMP-1 and MMP-13 have been strongly implicated in the destruction of cartilage in RA [96–100]. MMP-1 can also be localised to synovial tissue and is found in high concentrations in the synovial fluid of rheumatoid patients. While MMP-1 and MMP-13 are considered the major collagenases, MMP-2, MMP-8 and MMP-14 may be involved in arthritic destruction [101, 102]. Other enzymes, produced by activated fibroblasts, may contribute to the overall destruction of cartilage and bone . There is good evidence that, in OA, MMP-13 is responsible for much of the collagen degradation in cartilage as MMP-13-specific synthetic inhibitors completely block the release of collagen fragments from OA cartilage . Further insights into the biological and pathological role of MMPs have been gained using transgenic animals and gene transfer techniques. No rodent MMP-1 could be detected until recently, but two enzymes (Mcol-A and Mcol-B) are found within the cluster of MMP genes located at the A1–A2 position on murine chromosome 9. These enzymes are most similar to human MMP-1, sharing 74% nucleotide and 58% amino acid homology. One of these enzymes, Mcol-A, cleaves collagen at the specific cleavage site and occupies a position sytenic to the human MMP-1 locus at 11q22. Both enzymes are expressed during mouse embryogenesis, particularly in the mouse trophoblast giant cells, although neither enzyme is as widely distributed as MMP-1 in other species . This lack of expression of MMP-1 in rodents is a complicating factor making comparisons with human diseases difficult. Mice deficient in membrane type 1-MMP were found to have a severe phenotype, with the failure to turnover collagen at crucial stages of development apparently important . The ability of this enzyme to activate others such as MMP-13 could be responsible for this severe phenotype, or nutritional failure at the growth plate during development could be implicated. Transgenic mice that overexpress MMP-13 in hyaline cartilage result in erosions that resemble OA lesions with both collagen and proteoglycan cleavage . Transgenic studies so far have shown that no MMP/TIMP knockout has been lethal. It is possible that other MMPs compensate for one enzyme and this would explain the mild effects seen. For example, MMP-9 knockout mice had no obvious phentotypic defects but were shown to exhibit a delay in long bone growth associated with an abnormal thickened growth plate, where hypertrophic chondrocytes did not undergo apoptosis as rapidly as in normal animals . The first synthetic MMP inhibitors bound tightly at the active site and therefore blocked enzyme activity. Effective inhibitors mimicked the peptide sequences around the cleavage site in the substrate, and the scissile bond was replaced by a chelating group, such as hydroxamate, that bound to the active site zinc (Fig. 5). Other chelating groups such as carboxylic acid, thiol and phosphorus have been used and large numbers of inhibitors have been made . Early inhibitors (e.g. batimastat, BB-94) showed broad-spectrum inhibition for many MMPs but showed poor oral availability. Marimastat (BB-2516; British Biotech, Oxford, UK), a chemically modified form of batimastat, shows similar broad-spectrum MMP inhibition and is also orally active. Initial designs focused on broad-range inhibitors as it was thought that many MMPs were involved in cancer. 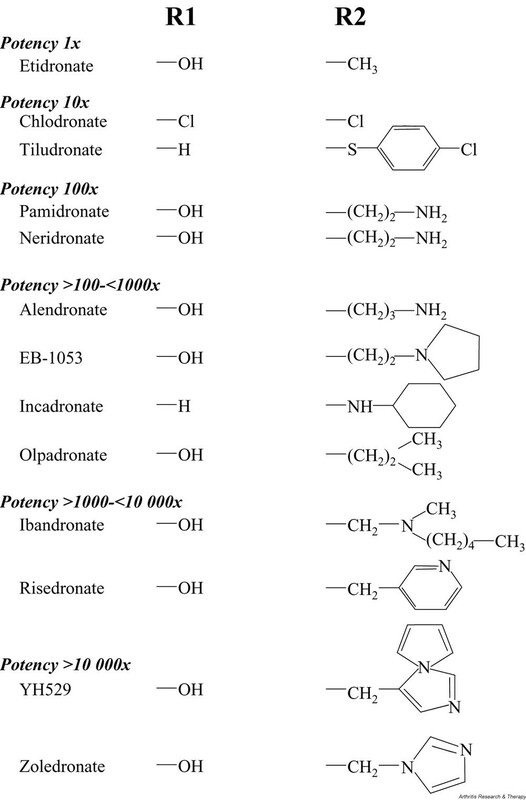 Many inhibitors were produced using conventional pharmaceutical screening processes before crystal structures were available, and the detailed chemical design of MMP inhibitors is reviewed in [109, 110]. Matrix metalloproteinase (MMP) inhibitor interactions. Subsites around the catalytic zinc (Zn) bind amino acids in the substrate on either side of the cleavage site. 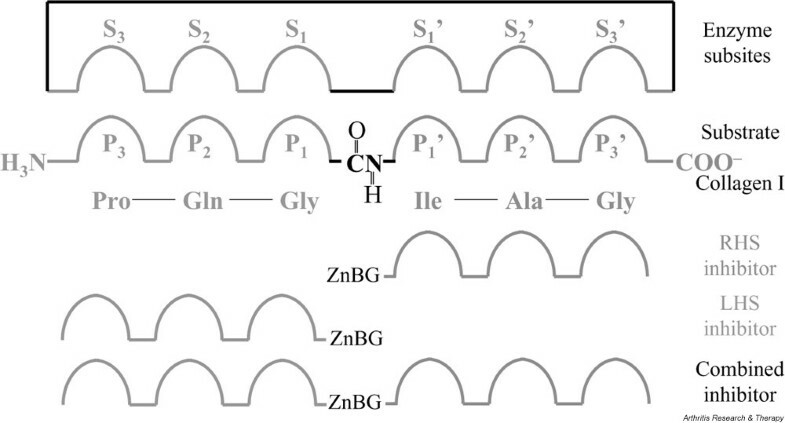 Synthetic MMP inhibitors use a zinc binding group (ZnBG) attached to modified peptides that can bind tightly to these subsites. LHS, left-hand side; P, position of residues in the peptide; RHS, right-hand side; S, subsites of the active site. As the crystal structures of the catalytic domains of MMP-1, MMP-2, MMP-3, MMP-7, MMP-8, MMP-13, MMP-14 and MMP-16 became available, new nonpeptide inhibitors with increased specificity for individual MMPs were made. At least some of the variation in substrate specificity among MMPs can be explained by differences in the six specificity subsites in the active site cleft and surrounding sequences (Fig. 5). The first subsite on the carboxy-terminal side of the substrate scissile bond, the S' pocket, is particularly important; for example, it is deeper in MMP-3 and larger in MMP-8 than it is in MMP-1. This, and differences out to the S' 4 position, offer possibilities for designing specificity in synthetic inhibitors. Two examples of nonpeptidyl hydroxamate inhibitors are prinomastat (AG-3340; Agouron, San Diego, USA) inhibitor, which is selective for gelatinases over collagenases, and Ro32-3555 (Roche, Basel, Switzerland), which is an effective inhibitor of collagenases but has less potency against MMP-2 and MMP-3. Many early studies were involved with the treatment of cancer. For example, marimastat (BB-2516) (an orally administered hydroxamate inhibitor of MMPs with limited ability to inhibit sheddase activity) has been in clinical development since 1994 . A recent study showed that marimastat significantly improved the survival of patients with advanced gastric cancer . CellTech (Slough, Berks, UK) developed highly specific gelatinase inhibitors and proposed that these could be effective for the treatment of cancer and bone resorption . Agouron developed prinomastat (AG3340) , a MMP inhibitor with a Ki value in the picomolar range for the inhibition of MMP-2, MMP-9, MMP-13 and MMP-14, with lower activity against MMP-1 and MMP-7 . Chiroscience (Cambridge, UK) developed D2163, now licensed to Bristol-Myers Squibb (BMS-275291; New York, USA), for the potential treatment of cancer. This compound inhibits a broad range of MMPs associated with cancer but does not inhibit shedding events, and it gives a 10-fold increase in systemic exposure for a given dose when compared with marimastat. BMS-275291 does not exhibit any deleterious side effects with tendons and joints. The compound prevents angiogenesis in a mouse model, and phase I studies in healthy volunteers have been completed showing that good plasma levels were achieved and that the compound is well tolerated. BMS-275291 has now entered phase II studies, and the results will be reported in 2003. Novartis (formerly Ciba-Geigy; Basel, Switzerland) published information regarding an orally active hydroxamate MMP inhibitor, CGS 27023A. This is a broad-spectrum inhibitor with a nanomolar Ki against MMP-1, MMP-2, MMP-3, MMP-9, MMP-12 and MMP-13, and is chondroprotective in both the rabbit menisectomy model of OA and the guinea pig model of spontaneous OA . Another inhibitor, tanomastat (BAY 12–9566; Bayer Corporation, West Haven, CT, USA), targets MMP-3, MMP-2, MMP-8, MMP-9 and MMP-13, with low activity against MMP-1, and was proposed for the treatment of OA. It is effective in guinea pig and canine models of OA , and human trials of BAY 12–9566 given to 300 OA patients for 3 months reported no musculoskeletal side effects. The drug was detectable in human cartilage of treated patients undergoing joint replacement . However, BAY 12–9566 was withdrawn from an 1800-patient phase III trial in OA following negative results in a separate cancer trial of the same drug  (see Safety of MMP inhibitors). Trocade (Ro 32–3555; Roche, Welwyn Garden City, UK), a selective collagenase inhibitor, was used in phase III trials for the treatment of RA. It has a low nanomolar Ki against MMP-1, MMP-8 and MMP-13, with approximately 10-fold to 100-fold lower potency against MMP-2, MMP-3 and MMP-9. It blocks IL-1-induced collagen release from cartilage explants and, in vivo, has prevented cartilage degradation in a rat granuloma model, in a Propionibacterium acnes-induced rat arthritis model and in an OA model using the SRT/ORT mouse . Clear evidence of protection to bone and cartilage was apparent even where active inflammation was present. Trocade had no effect on acute inflammation in rodent models, so presumably did not inhibit TNFα converting enzyme at these concentrations . Large-scale trials of trocade in RA patients, however, were terminated because of a lack of efficacy. Future data will show whether adequate concentration of this compound within the joint was achieved and whether the dosing schedule used was appropriate. This was the first large-scale trial in RA, and its failure to complete does leave the future of therapies targeted at the collagenases in jeopardy . The clinical evaluation of these drugs is difficult as long trials have to be conducted with radiographs being the most reliable measure of joint damage. While some progress has been made with the use of magnetic resonance imaging, this technology is not yet been proven and routine centres do not have access to a validated method for quantitation. Several studies have shown that the antibiotic tetracycline and its derivatives inhibit MMPs. Micromolar concentrations of tetracycline are sufficient to inhibit collagenase activity by 50%; greater activity is seen with some modified tetracyclins . Doxycycline hyclate (Periostat®; CollaGenex Pharmaceuticals, Newtown, PA, USA), at a subantimicrobial dose, is the only MMP inhibitor approved by the US Food and Drug Administration as an adjunct therapy in adult periodontitis . The results of patient studies for the use of tetracyclins to treat patients with rheumatic disease are equivocal , although there were positive trends. There is evidence that, in combination with nonsteroidal anti-inflammatory drugs, these compounds can be effective, and further studies are planned with the more potent derivatives . One advantage of the tetracyclins, if they prove to be effective, is that they are already in clinical use with a known side-effect profile. Bisphosphonates may directly inhibit the activity of several MMPs as tiludronate inhibited MMP-1 and MMP-3 but did not affect MMP production in periodontal ligament cells . Chlodronate was able to inhibit MMP-8 in peri-implant sulcus fluid . When any new class of drugs is used for the first time it will raise issues concerning safety. MMPs are involved in a large variety of physiological processes so the rate of wound healing, growth and foetal development could all be affected. There is a balance between matrix synthesis and matrix breakdown in connective tissues, so inhibition of MMPs could cause deposition of a matrix, leading to fibrosis, although dose ranging studies should avoid such complications. The most advanced safety data available is for marimastat, where musculoskeletal pain and tendonitis are identified as reversible side effects in treated patients . These effects commence in the small joints of the hand and spread to the arms, shoulders and other joints if the treatment is continued. The symptoms are time and dose dependent and could be reversible. These symptoms are also seen with the Roche compound Ro 31–9790, and this led to its development as an arthritis treatment being stopped. Some suggest that these side effects are caused by inhibition of MMP-1, but the effect is reproducible in rodents, which only express MMP-1 during embryogenesis , and no such events were noted with trocade, which inhibits MMP-1 very effectively. It is probable that inhibition of an uncharacterised sheddase enzyme, similar to TNFα converting enzyme, contributes possibly via effects on inflammation. All new compounds can be very effectively screened in rodent models for these musculoskeletal events and those which cause side effects discarded. The Bayer compound BAY 12–9566 was withdrawn as it was associated with increased tumour growth and poor survival times in small cell lung cancer, but no other cases of these effects have been reported . It is not logical to assume that an effect seen with one member of this class of compounds will automatically be seen by all and that there are significant differences in chemical structure and metabolism of individual inhibitors. Inhibition of cartilage collagen destruction still remains a viable target to prevent joint destruction in arthritic disease. However, the trials of MMP inhibitors have been extremely disappointing. New agents are still under development and these may overcome some of the problems of both delivery and side effects. A key to future success is to identify the specific MMPs that are responsible for arthritic tissue destruction in the different diseases. This will allow highly specific inhibitors that target individual enzymes and potentially reduce side effects. It should be possible to screen all new inhibitors across the MMP family to ensure specificity. A variety of explanations have been offered to explain why the metalloproteinase inhibitors have been unsuccessful in clinical trials in patients with joint diseases. In addition to a wealth of in vitro and animal in vivo data, much of the evidence supporting their role in human disease has shown that they are 'at the scene of the crime'. There is no doubt that MMPs are present and active in joint diseases. However, it could be that the MMPs or collagenases, in spite of their presence within the joint, are the wrong target in the arthritides, and that other enzyme systems such as cathepsin K predominate [126, 127]. If MMPs are responsible for cartilage damage, however, then it is possible that some compounds may not penetrate the cartilage/bone synovial interface and are therefore ineffective. Compounds may be altered in body compartments so that their specificity for individual MMPs is altered. An unrecognised MMP may be the major player in collagen turnover but is not inhibited by the available inhibitors, which were screened against a limited set of available MMPs. Altering the balance between active MMPs and TIMPs with an artificial inhibitor may upregulate the synthesis of more MMP and so promote destruction. It could be that activation is the major control point, and inhibition of the enzyme systems responsible for activation is the key to success. Alternatively, MMPs are involved in many cellular functions and the side-effect profiles of compounds that would prevent joint destruction have meant that effective compounds are excluded during development. Although synthetic inhibitors of MMPs have so far proved to be ineffective, there are several alternative approaches that can be considered. Much research is being directed towards the role of cytokines and signalling pathways in the regulation of the MMPs in disease. Blocking of certain cytokines or inhibiting the inflammatory cell signalling pathways may produce an alternative approach to inhibiting MMP production and activity. AntiTNFα therapy has proved successful for treating RA patients, and the levels of MMPs are reduced. Gene therapy approaches in which chondroprotective cytokines are overexpressed in affected joints show that the overexpression of IL-4 and IL-13 in experimental models of arthritis prevents MMP-induced cartilage destruction. It may also be possible to increase the expression of the TIMPs. For example, calcium pentosan polysulphate stimulates the production of TIMP-3 in human synovial fibroblasts and rheumatoid synovium without affecting MMP production . As more detailed information about the structure of MMPs and their interaction with substrates becomes available, it may be possible to design inhibitors that target areas of the enzyme other than the active site. For example, the C-terminal haemopexin-like domain of collagenases has long been known to be required for collagenolysis, presumably because of interactions with the substrate . The activation of the proenzyme is also a valid target, again requiring a detailed knowledge of the underlying biology. An understanding of the regulation of expression of both MMPs and TIMPs at the molecular level may allow us to modulate the levels of both enzymes and inhibitors expressed by cells during disease. This will require detailed analysis of the signalling pathways involved in transforming a cytokine signal at the cell surface to induce the expression of proteinase or inhibitor. 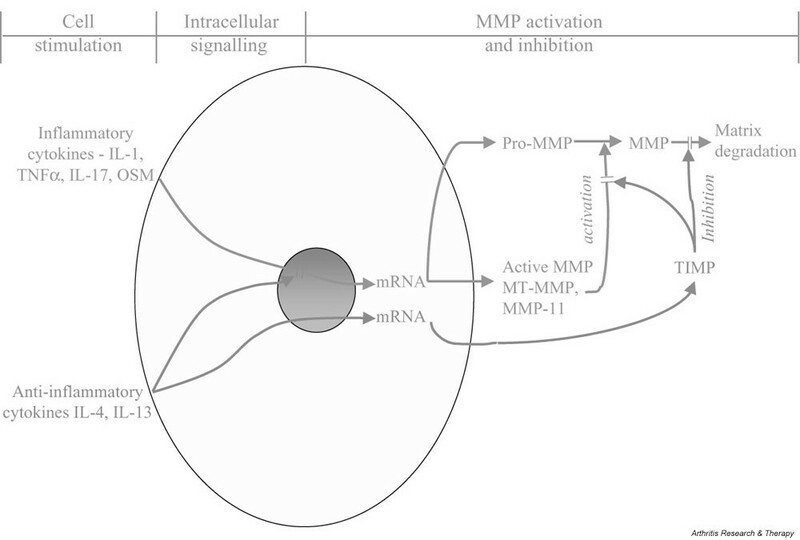 Considerable effort is being expended in preventing the production of MMPs by interfering with the cytokine signalling pathways . Finally, there is interest in the synthesis of modified TIMPs that are specifically targeted to inhibit specific enzymes [131–133]. It is interesting that, when patients are treated with the new anticytokine therapies, a greater protection of the joint is obtained when this is combined with more conventional treatments. It is probable that blocking of MMPs will be more effective if combined with treatments that target earlier steps in inflammation. Furthermore, as noted earlier, MMPs are not alone in being implicated in joint disease. Serine proteinases are believed to be involved in MMP activation, and cysteine proteinases have been shown to degrade collagen. It may be necessary to combine proteinase inhibitors, either in sequence or with other agents that hit other specific steps in the pathogenesis, before the chronic cycle of joint destruction found in these diseases can be broken. The destruction of bone and cartilage during arthritic and osteoporotic disease is becoming a major concern with the ever increasing age of the population. With the increased prevalence of these diseases, the development of new therapies and approaches to treatment are required. Bisphosphonates have proven to be particularly effective at preventing loss of bone mineral density. They may also have beneficial effects for treating RA because encapsulated bisphosphonates are capable of reducing macrophage levels, and some appear to act directly as MMP inhibitors. MMP inhibitors are being developed to directly address the destruction of cartilage during arthritic disease. The results from MMP inhibitors in human trials are so far disappointing because these inhibitors suffer from a range of side effects and show little effectiveness in preventing joint destruction. The side effects could be overcome with the use of more specific MMP inhibitors, although this requires the identification of the enzymes responsible for arthritic joint destruction. MMP inhibitors may also prove to be more effective when used in combination therapies, such as with the biological anticytokine therapies, so that both the activity and the production of MMPs are reduced. The development of new therapies coupled to a greater understanding of the disease processes will lead to the development of even more effective treatments in the future.